Non itchy Tetraglass Gaskets are braided by texturized Tetraglass fiber yarn is designed as a replacement for Asbestos / Ceramic Tapes has no known hazard towards environments.Designed to expand and contract, these extremely flexible Tetraglass Gaskets can withstand continuous exposure of 1200°F / 650°C, has low thermal conductivity coefficient and are completely non-combustible. 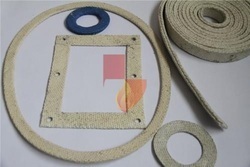 They are widely used as Heat Insulation Pads on Pipe wrap and can also be used for industrial ovens, furnaces, boilers and wood burning stoves, crucible packing and pollution control equipment; high temperature tying and lacing cords and tadpole tape / gasket core ropes. The basic fiber is manufactured in accordance with specifications outlined in ASTM D-578, ASTM committee D13, and subcommittee D13 1B. Looking for Tetraglass Gaskets ?